1. Wash mussels in a colander to get rid of sand. Set aside. ​2. Cook spaghetti until al dente or as per instructions on the pack. Drain in a colander, pour about two tablespoons olive oil, mix well. While spaghetti is cooking, get ready with the sauce. 3. In a large wok, heat 4 tablespoons olive oil on low-medium flame , add garlic, chili flakes and stir fry for about a minute until fragrant. 4. Add cherry tomatoes followed by mussels and white wine. 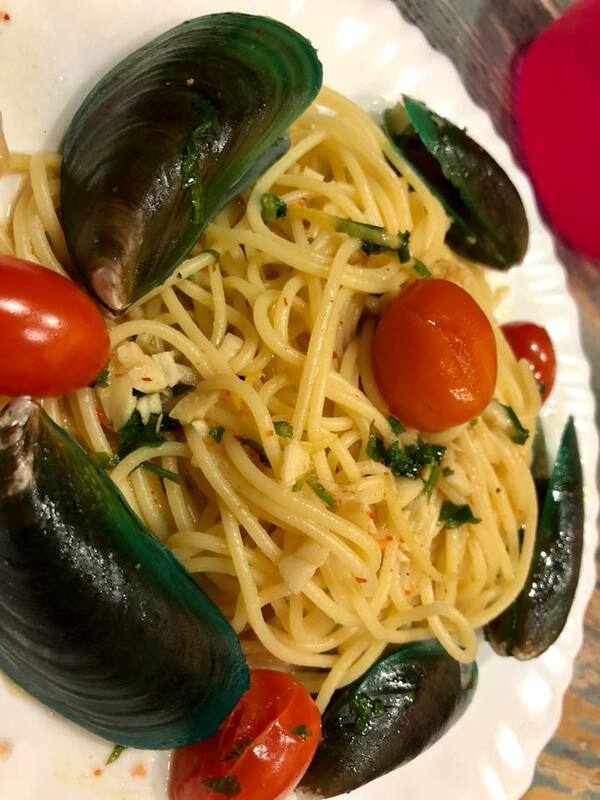 Increase heat to medium flame, stir well, cover and cook for about 4-5 minutes until mussels open up and are fully cooked. Discard any unopened shells. 5. Season with salt, pepper and crushed Oxo stock cube. Stir well, finally adding lemon juice and parsley. Bring to the boil. 6. To plate the dish, split hot spaghetti into four portions. Pour white wine sauce followed by mussels and tomatoes. Serve hot. Lap up any extra sauce with toasted whole grain loaf.